Algeria's Abdelaziz Bouteflika Says He Will Seek A Fifth Term As President Abdelaziz Bouteflika has been in power since 1999 and has changed the constitution in order to stay in office multiple terms. 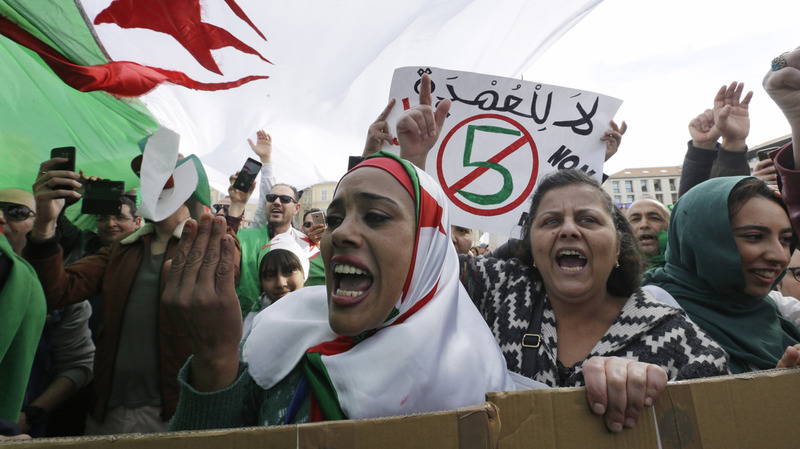 Demonstrators stage a protest against President Abdelaziz Bouteflika's bid for a fifth term, in Marseille, France. Algerian President Abdelaziz Bouteflika has confirmed he will seek re-election despite widespread protests against him staying in power, but has promised to call for elections within one year to replace him if he emerges victorious in April. Demonstrators have gathered across Algeria and France over the past week to protest Bouteflika's bid for a fifth presidential term. On Friday thousands of Algerians participated in a "million man" march, prompting police to fire tear gas and rubber bullets, and the government to shut down wireless data networks. Maher Mezahi, a freelance journalist based in the capital city of Algiers, tells NPR that Bouteflika's promise of new elections within a year appears aimed at stemming the demonstrations. "It's an interesting move because now he is acknowledging that something has happened with these protests. They have obviously gotten to him. The question is, will this quell them, or will this intensify them?" Mezahi says. Bouteflika submitted his election papers at the Constitutional Council in Algiers on Sunday, according to Algerian state media. Bouteflika has been president of Algeria since 1999. The 82-year-old president suffered a stroke in 2013, and has been seen in public rarely since. This will be Bouteflika's last election. He passed a constitutional referendum in 2008 to remove a two-term presidential limit, but that was reversed in 2016, meaning if he wins this year, he will have to leave office in 2024. Bouteflika's election in April is almost assured. His party, the National Liberation Front, has held power since Algeria's independence from France in 1962. Opposition parties have struggled to unite behind a candidate. In 1991, a multiparty election in Algeria sparked a decade-long, violent civil war, which killed more than 200,000 people. The war ended in a return to authoritarianism, and memories of the conflict have helped Bouteflika and his party stay in power. "The Algerian government, for a long time, they've always used that to scare us. To say like, 'We don't want this to be the civil war of the 1990s. We don't want this to be like the Arab Spring. Look what happened to all of those countries,'" says Mezahi. "But now these people are so young," he continues. "It's a completely new generation, who's never really seen the death or chaos that the government keeps threatening us with. I think that's one reason you see so many young people out on the streets." Social media has helped young protesters to rapidly mobilize, says Mezahi, noting that demonstrations over the past week were the largest in Algeria since the Arab Spring. Dissatisfaction with the economy is one factor driving many of the demonstrators to the streets, says Caroline Abadeer, a Ph.D. candidate in political science at Stanford University. "Most of the state's resources come from oil, and oil prices have been down, which reduces the finances available, and that has resulted in cuts in spending." She says the government has had more trouble meeting people's demands for good jobs and public benefits, and this has added to demonstrators' frustrations. Protesters have also gathered in Paris, Marseille and other French cities, home to an Algerian diaspora. Many waved Algerian flags. "'No to the mandate of shame, 20 years is enough,'" proclaimed one placard according to Agence France-Presse. Since gaining independence from France, "Algeria has been run by the same group of men, the same system," 62-year-old Abderrahmane Hamirouche told AFP. "Algeria is ruined while it's a country that potentially could be rich. What is there left for future generations?" he asked. Some protesters criticized the stagnant economy, and others spoke out against restrictions on speech and freedom of expression. Nadia Tamzali, a 62-year-old Franco-Algerian doctor, criticized the country's dominance by the military. "They have killed our culture — nearly all the cinemas have disappeared," Tamzali told AFP. Mezahi tells NPR he expects demonstrations to continue throughout the week, and for protesters to gather again en masse this Friday, the first day of the weekend in Algeria.